On August 1st, in the island of Ponza, at i Cameroni dei Confinati (aka Museum) of via Roma, the exhibition “Lo Stracquo: l’arte che viene dal mare” opens to the public. The project is run by the association Calafelci and Pinacoteca of Gaeta. A work/installation of mine “Sherena Velella” takes part among the sixteen selected. 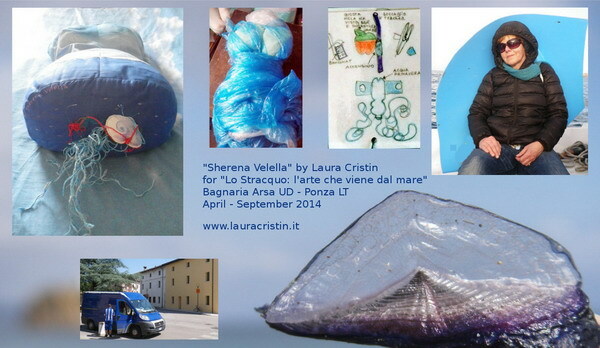 The textile bust filled with feelings/emotions coming from/leaving the very center of Mediterraneo, has joined at last the “blue sail” already there since its repechage in April. I will be there too from the August 24 till the 30 and at the finissage on Sunday, September 14th, 2014.